One of the country’s most worthy causes, Pendleside Hospice, continues to provide much-needed care to individuals with life-limiting illnesses. At Fuel Card Services, we continue to highlight the great work that is carried out by Pendleside Hospice. 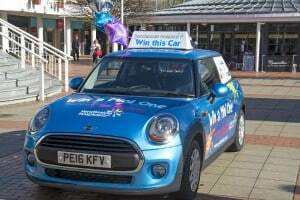 The 2016 Pendleside Hospice Car Raffle will see entrants vying to take home a brand new car. Six local organisations have banded together to help raise the funds for this year’s top prize – a Mini One. The Pendleside Hospice summer raffle raised more than £27,000 last year. The hospice hoping that even more can be raised in 2016 to support the ongoing operation of this essential facility. Tickets are available for purchase now. The final draw will be held on Saturday, September 24th at Charter Walk Shopping Centre in Burnley. Funds raised will support those in need as they enter the final days of their lives, after battling life-limiting illnesses. The hospice and its dedicated staff are also there for the families and loved ones of those facing these dark and trying times. Hospice staff provide somewhere for loved ones to turn for understanding and support in their own hours of need. Pendleside Hospice is funded entirely through charitable donations. Therefore, the support of the local community is essential to ensure the hospice can continue to provide this exemplary service. Fuel Card Services calls on as many people as possible to take part in this year’s raffle. After all, it’s for an excellent cause!